Our Lady of Guadalupe is a celebrated Icon of the Blessed Virgin Mary. There were two accounts published in the 1640’s, one in Spanish and one in Nahuatl. They tell how, while walking form his village to Mexico City in the early morning of December 9, 1531, a peasant Juan Diego (now St. Juan Diego who’s Feast Day we celebrated on the December 9th) saw on the slopes of the Hill of Tepeyac a vision of a girl of fifteen or sixteen years of age, surrounded by light. Speaking to him in Nahuatl, the local language, she asked that a Church be built at that site, in her honor. From her words, Juan Diego recognized the Lady as the Blessed Virgin Mary. Juan Diego told his story to the Spanish Archbishop, Fray Juan de Zumarraga, originally from Spain, who instructed him to return to Tepeyac Hill, and ask the lady for a miraculous sign to prove her identity. The Blessed Virgin Mary told Juan Diego to gather flowers from the top of Tepeyac Hill. Although December was very late in the growing season for flowers to bloom, Juan Diego found at the usually barren hilltop “Castilian” roses, not native to Mexico, but native to Spain where Bishop Zumarraga is from. The Blessed Virgin arranged in Juan Diego’s tilma cloak, the flowers. He was asked to not open his tilma for anyone but the Bishop. When Juan Diego opened the cloak before Bishop Zumarraga on December 12th, the flowers fell to the floor, and in their place was the image of the Virgin of Guadalupe, miraculously imprinted on the fabric of his tilma. 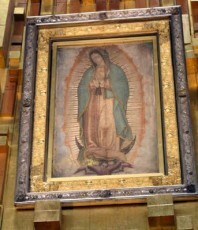 The Icon is now displayed in the Basilica of Our Lady of Guadalupe, in Mexico City, Mexico. This Shrine is one of the most visited Marian Shrines in the world. The Icon is Mexico’s most popular religious and cultural image, bearing the title, “Queen of Mexico”. In 1999, Pope John Paul II proclaimed the Virgin Mary as “Patroness of the Americas, Empress of Latin America, and Protectress of Unborn Children” under this Marian title, “Our Lady of Guadalupe”.